The definitions of Art and Science, respectively, include the conscious use of skill and creative imagination, an occupation requiring knowledge or skill, the state of knowing. Art is the main theme this article. 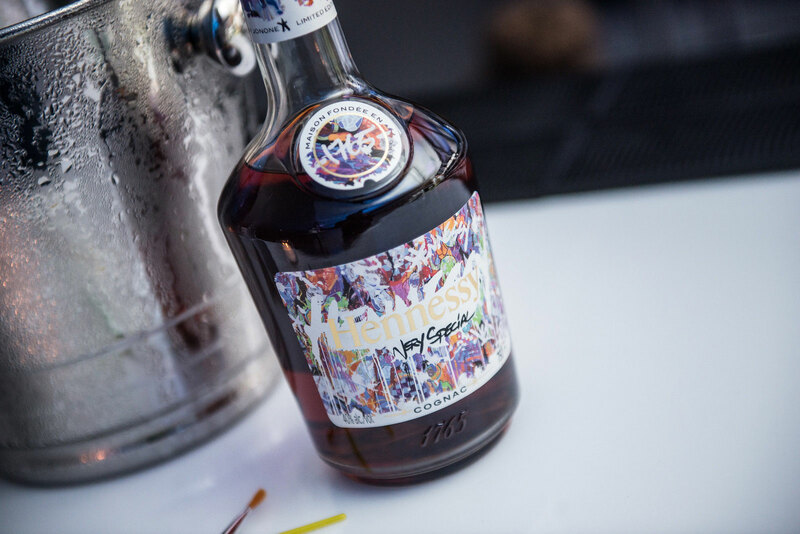 The rare opportunity to interview the graffiti artist JohnOne who is the latest to create the label for the annual Hennessey Very Special release. He uses vibrant colours as a signature of his dimension—very abstract. Less abstract but innovative, Forty Creek has proven to be well received with it‘s annual special releases and this year was the first without founder John Hall. Fans were still well-served. Forty Creek’s Master Blender, Bill Ashburn, who worked alongside John, is still creating the new whiskies—the Heritage is this year’s edition (sold out in Ontario). Bill feels that whisky shouldn‘t hit you over the head, he likes aromas, body, and flavour, which make whisky easy to enjoy and sip. JohnOne has been called the master of the blazing blends. Blending influenced him, but it was the blending of colours. He mixes his own colours, his artwork with so much energy is distinctive when seen you know that it‘s by JohnOne. Another master blender who has been created, and well-received is Dr. Don Livermore from Hiram Walker & Sons Ltd. Earlier this year I wrote about the Northern Border Collection, which has finally come out. 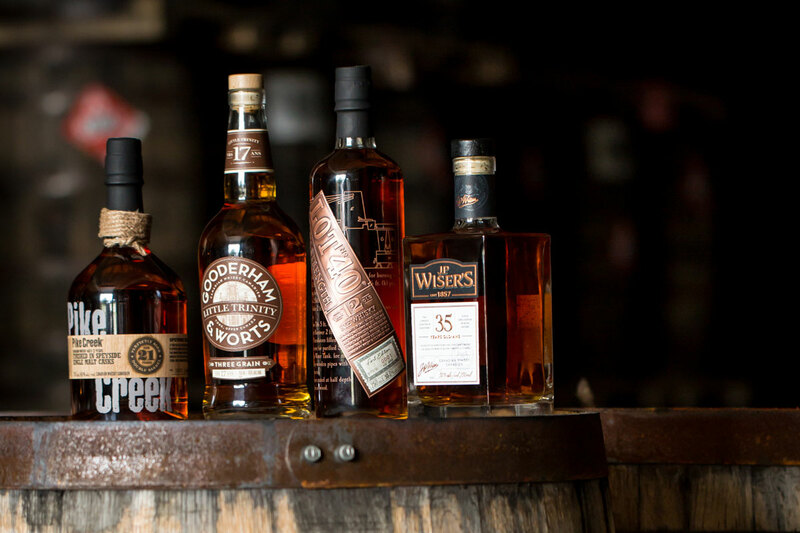 The range of four whiskies represents the first in a new line of annual releases, which include the Lot 40, 12-year-old Cask Strength (LCBO $69.95); Gooderham & Worts Little Trinity 17yo Three Grain Blend (LCBO $79.95); Pike Creek 21yo, Single Malt Cask Finish (LCBO $89.95); and the JP Wiser’s 35yo (LCBO $164.95). A hint, keep an eye out for these bottles if you’re traveling outside of Ontario, in Canada- you’ll probably have a better chance of finding some. It’s been a while since a dream dram was mentioned. The most prestigious Highland single malt whisky ever created was by Glenmorangie. 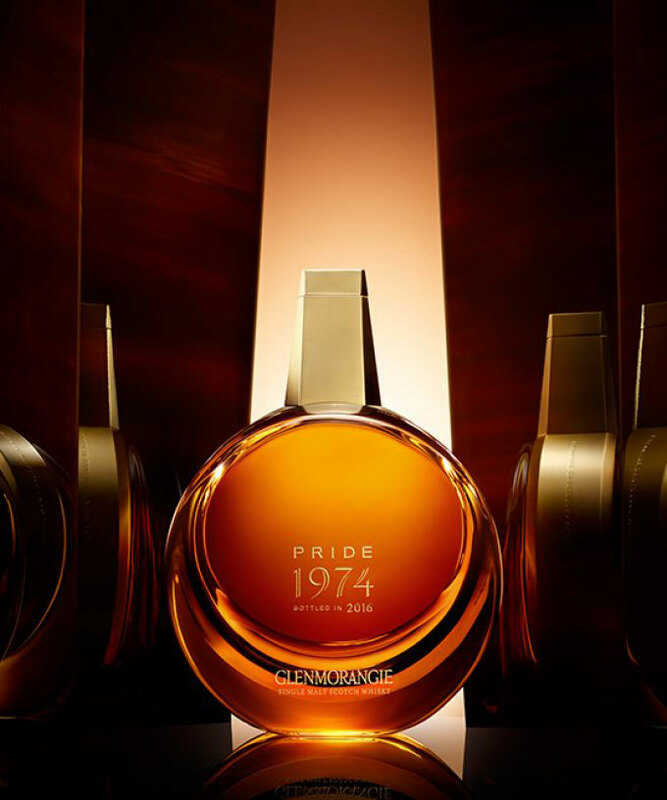 Glenmorangie Pride 1974 is the Distillery’s most rare and treasured malts, with just 503 crystal decanters available. A creative partnership was shared with Steinway & Sons where Steinway Artist Aaron Diehl composed a piece of music which embodies the whisky’s rare beauty. Fortunately, this is not a dream dram! I got to taste this great whisky, of which only one bottle was available through the LCBO for about $17,000 and long since purchased. I can still smell the deep fruitiness, citrus, chocolate, cedar, and nuttiness; tasting rich of apples, oranges a nuttiness with light spice on the edges, aniseed, chocolate, toffee and Turkish delight were some of the flavours. Now it’s a dram I can dream of tasting again, not for the first time. If you look back to last year you can see my article on the Glenmorangie Distillery and its core whiskies including my favorite, The Signet (LCBO $339.95) back with limited availability. A couple of updated have recently been released for those looking to learn more about whisky. Davin de Kergommeaux has released the Second Edition and updated version of his best selling “Canadian Whisky: The New Portable Expert”. It covers everything about Canadian whisky from its early history, distilling, ingredients, processes and includes the major distilleries and newcomers. An update to the legendary Michael Jackson’s “Whisky – The Definitive World Guide”, has been released. A great source for those looking to learn more about and distilleries from around the world and the whiskies they produce – great reference for when you’re traveling. It is also for those who appreciate a great reference book in their library or coffee table wish exquisite glossy pages and vibrant colour pages, much like the ones you’re holding in your hand. My time in this issue has been limited, and so much to tell you about, so you can see more about this book at its webpage or if you want more information on anything feel free to write or to subscribe to my forthcoming newsletter. If you’re looking for a gift, you can’t go wrong with either of these books or the whiskies and Hennessey mentioned above.